Finding the right credit card means choosing a card that will best suit your needs. You may have a large balance to transfer over to another card with lower interest, or you may be looking to change your credit card to one with a lower interest rate. Shopping around and researching your options is the best way to guarantee a credit card tailored towards your requirements. When researching a credit card the golden rule should always be to go for the lowest annual percentage rate you can find. Research online using comparison websites to find the best annual percentage rates (APR)you can. If you have been with a bank or building society for many years, and have a good relationship with them, then you may be able to find that you can apply for credit cards with very low or zero interest rates. You may find great deals on credit cards by looking for introductory offers. There are many introductory offers that provide zero or low interest annual percentage rates either for a fixed period or for the life of the card. Many credit cards will fix these low rates for terms of around six or twelve months but some cards do have longer terms of around 15 months. Always check whether these offers are for balance transfers or for purchases; keep an eye out for cards that gives both. If you are juggling credit cards, or simply have a balance on a high interest card then you should consider transferring the balance. Financially, it makes sense to transfer a balance from a high interest card to low interest card. If you can move all of your debt over to zero or low interest credit card then you will save a lot of money in interest fees. However, if you are the sort of person who has a lot of debts, and know you will not be able to resist spending money on your new credit card then taking a loan maybe the better option. Loans usually have lower interest rates than credit cards and are for a set period of time; meaning you will know exactly when the loan period ends. If you cannot resist the temptation to spend money on your credit card then you could end up endlessly repaying the credit card. One of the main factors regarding the annual percentage interest rate you may receive will be your credit rating. If you have a very bad or poor credit rating you can expect to be charged high rates of interest, if you are actually offered a card at all. There are companies that specialise in credit cards for customers with bad credit ratings. However, the limit you will receive with these credit cards will be very low, and the interest rate will be very high. 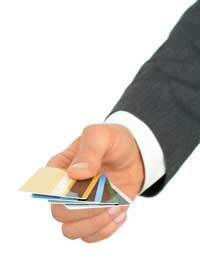 If you have a good credit rating then finding the right credit card shouldn’t be a problem. Customers with excellent credit ratings should be able to apply for zero or low percent interest rates cards without much problem. Realising what type of borrower and spender you are should be some help when finding the right credit card. If you are a heavy spender that uses a credit card frequently but still pays off the balance every month then a zero interest credit card may be right for you. But if you do pay off the card before the interest is applied then you may not have to worry too much about the interest rates. If you are the type of person that is not likely to make repayments on time then you should avoid zero interest credit cards. The interest on these cards will kick in when payments are missed, and the interest will be higher than normal credit cards. Add this to late payment and missed payment penalties and this could be a very expensive form of credit. Many cards will offer incentives such as low rates for an introductory period but once this period is over the interest may be higher. Gauge your credit card choice on the type of spender you are rather than incentives offered to you. Many cards offer cash back services but remember that these services usually come with a fee, and there may also be annual fees to consider. Finding the right credit card for you will mean researching your options thoroughly. Speak to a variety of different lenders and compare credit cards online. Take your time to weight up which will be the best credit card for your requirements, and always carefully read the terms and conditions of any credit card contract before signing.